Don rose-coloured glasses for ’70s-sheened Twelfth NightWith the exception of the not-so-stellar opener Death of a Clown, UVic’s Phoenix Theatre is knocking it out of the park this season. The latest home run comes in the form of their fresh, inventive production of Shakespeare’s Twelfth Night.Traditionally set in the ancient Greek region of Illyria, director Linda Hardy has chosen to move this production to 1970, with delightful results. Not only do Cat Heywood’s costumes (not to mention Kerem Çetinel’s always excellent lighting and Allan Stichbury’s set, which is a re-vamping of the white round used in Yerma) transport us back to shortly after the Summer of Love, composer and musical designer Jeffrey Pufahl has taken us there sonically, using both live (with playing by multinstrumentalist Andrew Gillott) and recorded renditions of notable tunes of the era — and we’re talking early ’70s, so Beatles, not Bee Gees — to add a fun twist to the show.The play starts when the shipwrecked Viola (Sarah Koury), who presumes her twin brother dead, disguises herself as a man named Cesario and joins a band of Hare Krishnas so that she might serve under Ilyria’s ruler, Orsino (Liam Volke). 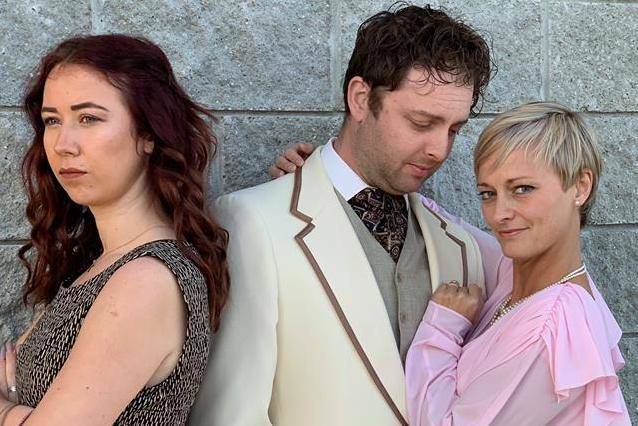 Orsino is attempting to woo the grieving Lady Olivia (Randi Edmundson), and sends Cesario to bring her tidings of his devotion — with unexpected results. Throw in a party-going noble and his mischievous entourage, a snotty servant and a singing fool and you have a classic Shakespeare comedy about mistaken identity and gender-role reversal where everyone lives happily ever after.There are lots of strong performances here; Koury’s Cesario is well-balanced, with his (or her) affection for Orsino occasionally bubbling to the surface but being quickly subdued, with Edmundson and Volke also delivering quality to their leads. But some of the best moments arguably came from the supporting characters and sub-plots. Cobi Dayan as the booze-soaked Sir Toby and Andrew Wade as Olivia’s stuck-up servant Malvolio provide much comic relief. After playing the tormented lead in Yerma, Kesinee Haney gets to play the fool here; she’s one of two alternating actors playing Feste, and was in fine form opening night, both in terms of acting and singing abilities. Director Linda Hardy has added some great physical flourishes to the performances here (having a movement coach in Kaz Piesowocki likely added to this, too) that draw laughs without dipping too far into slapstick territory. The only flourish I didn’t care for was the occasional addition of “far out” and “bummer” to punctuate a passage; it wasn’t necessary and detracted from the script. Other than that, Twelfth Night slipped into the ‘70s surprisingly well.If you’re looking for an entertaining, creative take on Shakespeare that is a feast for the senses, don’t miss this production. And with the world premiere of Daniel MacIvor’s Inside next up in the Phoenix’s season, it seems the winning streak will likely continue.